We posted the organizer's race report with the results. South African champion and stage one winner Daryl Impey was able to hold onto the green points jersey after a close battle all week. 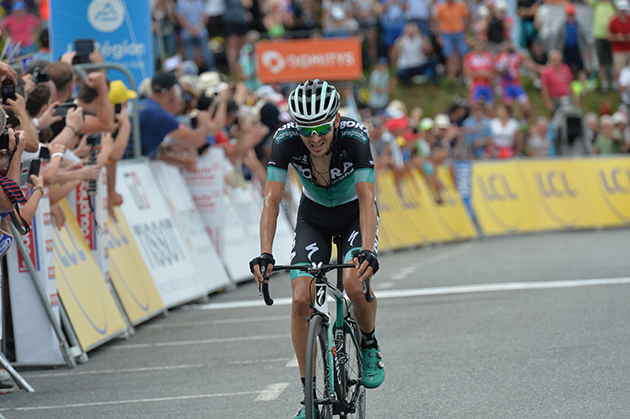 The final stage was no easy feat with four, first-category climbs coming within the short 136kilometre race with a summit finish up to Saint-Gervais-Les-Bains. On the first climb of the day, after multiple attacks, a breakaway of six riders formed ahead of the peloton. The group rode out to around three minutes with the main GC contenders watching one another in the main peloton. On the final steep first category climb, the race was on and the breakaway began to split up on the steep slopes. David Gaudu (FDJ) attacked and led the race solo for most of the climb as the chasing group behind dissolved, to leave only the five main GC contenders including Yates. The group hovered 40seconds behind but continued to work together to slowly reel in the remaining escapees and finally Gaudu. Navarro was the next to attack and the move looked promising, however biding his time behind, Yates waited for the chasing group to start to suffer and went on the attack alongside Roman Bardet (AG2R). Within the final kilometre, as Bardet slowed, Yates continued to keep the pressure on the pedals and pushed away, over taking the leader Navarro in the last 50metres to take the stage win and cement his second place overall behind Geraint Thomas (Team Sky). Adam Yates wins the final stage. Sirotti photo. “It’s been two back to back hard stages. The past four days, I’ve always been the one to initiate the attacks. So today I decided to wait. I just made that final move towards the end. "I could take the stage win on the last corner. Romain Bardet was trying to overtake me in the GC but every time I responded. Geraint Thomas recovered from a couple of setbacks on the final stage of the Criterium du Dauphine to finish fifth and win the race overall. Thomas suffered two punctures in the second half of the 136km stage from Moutiers to Saint-Gervais Mont Blanc, but received excellent support from his teammates to regain position each time. Thomas' win was Team Sky's sixth in the race and following the stage, and the Welshman was still struggling to come to terms with his achievement, beaming: “It’s incredible, it hasn’t sunk in yet!" He added: “I was always thinking of the next stage, the next climb and it’s an amazing feeling [to win] and I think it will really start to sink in tonight. It’s a massive race and it’s an incredible feeling. Geraint Thomas on the 7th stage's final climb. Sirotti photo. Earlier, a fast start to another short stage had prevented any breakaways forming until a small group managed to escape with 28 kilometres gone containing Dani Navarro (Cofidis), David Gaudu (Groupama-FDJ), Edward Ravasi (UAE Team Emirates), Antwan Tolhoek (LottoNL-Jumbo), Pierre Rolland (EF) and Julian Alaphilippe (Quick Step). Team Sky helped lead the chase in the peloton with Luke Rowe and Dylan van Baarle driving the main bunch and ensuring that the breakaway did not gain too much time and this pace started to reel the escapees back in. Thomas suffered his first flat tyre ahead of the Col des Saisies, but was quickly able to recover and regain his position in the peloton before he punctured again with 41km to go and had to chase back to the AG2R-La Mondiale-led peloton. This time Van Baarle and Kwiatkowski were on hand to pace him back to the rest of the team who were able to guide the race leader back to the main bunch. It was on the final ascent to Saint-Gervais Mont Blanc that the GC group dwindled, with Tao Geoghegan Hart again playing a pivotal role in both protecting Thomas from attacks and pacing the climb. With three kilometres remaining he finally peeled off as a number of the favourites attacked but had their advances nullified until the final 300 metres which saw Dan Martin (UAE Team Emirates) and Yates escape, but it was too little, too late and Thomas secured the overall victory by one minute. With the ever-consistent Geoghegan Hart in the upper reaches of the general classification and several strong finishes on the mountain stages from Jonathan Castroviejo, Team Sky also topped the team classification to round off a successful week in France. The final stage of the Critérium du Dauphine saw a six riders breakaway, which was caught shortly before the last ascent. The race came alive as all the main GC contenders launched several attacks on the final climb. BORA – hansgrohe climber Emanuel Buchmann did a stellar job and secured his 6th place in the overall ranking as he came in 4th on the last stage of the Critérium du Dauphine. The final 136km of this year’s Critérium du Dauphine started in Moutiers and took the riders back over the Cormet de Roselend from the opposite side to yesterday before a series of categorized climbs including the final ascent to the finish line in Sain Gervais Mont Blanc. This final climb stretched out 9.8km with an average gradient of 8% and completed today’s elevation of more than 4.100m. Today’s tactic was easy, full support for Emanuel Buchmann to secure his top ten position. Peter Kennaugh and Alex Saramotins withdrawn from the race after they gave everything for their teammate, therefore Lukas Pöstlberger, Jay McCarthy and stage winner Pascal Ackermann were the men to support Emanuel. As approaching the first climb of the day, after 40km of racing, a breakaway of four riders pulled away, BORA - hansgrohe was in the bunch. With 68km remaining the escapees had two minutes advantage over the peloton, where Team Sky set the pace. Pascal Ackermann withdrawn from the race after the first climb. As the race headed into the last climb of the day, the escapees were caught by the reduced bunch. BORA – hansgrohe climber Emanuel Buchmann was up there and rode with the other main GC contenders. In the final climb the race exploded and saw several attacks, Emanuel was able to follow every attempt. The German rider showed a confident ride and launched an attack with 3km remaining. 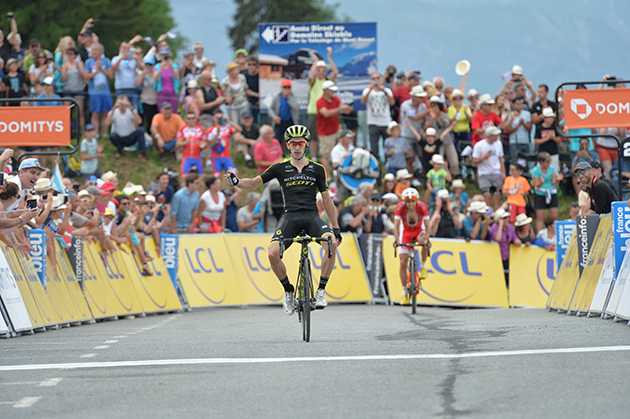 On the final metres A. Yates increased the pace and took the stage win ahead of D. Navarro. R. Bardet overtook E. Buchmann, who finished in fourth place and secured his 6th place in the final classification. Emanuel Buchmann finishes the stage. The Critérium du Dauphiné concluded today in Saint-Gervais Mont-Blanc with the last of four summit finishes. The British rider Adam Yates won the final stage, his compatriot Geraint Thomas secured the overall victory. Lotto Soudal was not able to take a stage victory in the Critérium du Dauphiné, but the team can look back on a strong collective performance. Victor Campenaerts just missed out on the podium during the prologue in Valence. The following day, Tiesj Benoot sprinted to a fourth place on the slightly uphill finish in Saint-Just-Saint-Rambert. In Belleville, Jens Keukeleire took the fifth place in a reduced bunch sprint. Lotto Soudal delivered an excellent performance during the 35 kilometres long team time trial and finished in third place. Only Team Sky and BMC were faster. Thomas De Gendt joined the breakaway in both stage five and six, but without success. Tiesj Benoot wanted to test himself during the mountain stages and finished fourteenth in the general classification. Two other races were scheduled today for Lotto Soudal. The Irishman Sam Bennett sprinted to victory in the 102nd edition of Rund um Köln. The Bora-Hansgrohe rider beat the Estonian Raim and the German Kittel. There was no top ten result for Lotto Soudal. The second stage of the Tour de Suisse ended in a reduced bunch sprint. World champion Peter Sagan took the victory ahead of Fernando Gaviria and Nathan Haas. Lotto Soudal rider Bjorg Lambrecht finished in eleventh place. We posted the report from stage winner Peter Sagan's Bora-hansgrohe team with the results. 10 June, 2018, Frauenfeld (SUI): Stefan Küng made the most of racing on home roads on his first day in the leader's jersey to consolidate his lead by taking three bonus seconds at the intermediate sprint before crossing the line safely to retain the overall lead. The 155km stage was made up of four laps of a 38km circuit, featuring a category 3 climb, and saw an early breakaway of three riders gain a three-minute advantage. Küng's BMC Racing Team teammates, Alessandro De Marchi and Michael Schär, controlled the race and kept the breakaway's advantage to less than three minutes until the halfway mark, when the sprinters' teams started to help with the chase with the expected bunch sprint in mind. Michael Albasini (Mitchelton-SCOTT) bridged to the three leaders with 50km to go, by which time the peloton, led by BMC Racing Team, was 1'30" back. The breakaway was eventually caught with 26km to go on the final lap, which allowed Küng to win the final intermediate sprint and claim three bonus seconds, before the stage was set for an aggressive finale. Bora-hansgrohe set a fast pace on the climb to force a split in the peloton while up ahead, Richie Porte tested his legs with an attack with 19km to go. Porte's attack was neutralized with 18km remaining before seven riders gained a small advantage in the final 10km. Simon Gerrans and Tejay van Garderen put in a big effort to bring them back with 5km to go and from there, the sprint trains were formed. 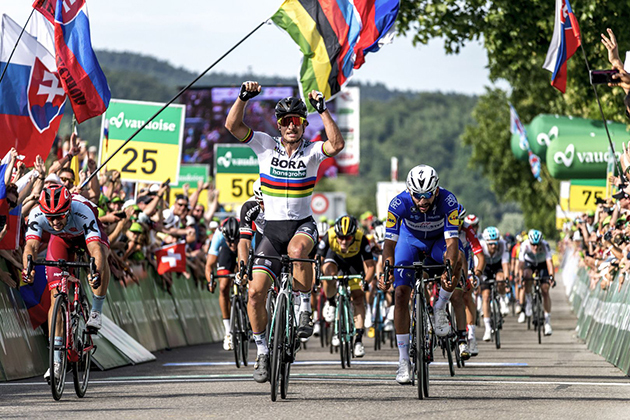 Peter Sagan took the win in Frauenfeld ahead of Greg Van Avermaet, who sprinted to eighth place, and Porte and Küng crossed the line in the peloton. Peter Sagan wins Tour of Switzerland stage two. Küng sits three seconds ahead of teammates Van Avermaet, Porte, and van Garderen in the top four of the General Classification, while Gerrans is in eighth place. "It was great today. I think I knew half of the public on the side of the road. It was really cool beforehand because a lot of people told me that they were going to be there. It was a pretty easy start and I had time to look around and say hello to the people so that was really nice. Once the racing started, I felt good immediately so I took the chance to take the bonus seconds in the sprint because everything came back together. Then, we just wanted to be up there and attempted to cover the moves. Richie said 'I think I should attack' and I said 'why not' so, he gave it a go. It is always better to be on the offence than on the defence so I think we did a good job. In the end, it came down to a sprint but I think Greg was up there so overall it was a good day for us." "I had a look at this parcours for the first time about two months ago and I thought then that it probably wouldn't do that much damage but then when you race it and it has small roads and it's up and down, left and right, if you're in position 100, the guys in front of you are already 200m ahead. I think that was what caused the split plus the really hard racing from the intermediate sprint. So for us, it was perfect because going as hard as possible, we could drop some sprinters and then it is less dangerous. For sure, it is hectic but for us it makes it a lot easier. We have such a strong team here and I think we were up there present with five guys and two guys were riding in the beginning. I think we should we showed we are ready for it." "Tomorrow is also going to be a hard one. I also had a look at this stage. The climbs are a little bit longer but they are not as steep. With the weather announced, there might be some thunderstorms but I except the same type of racing as today." "There was not really any intent behind the attack but seeing as I was there and the sprinters' teams were either missing their sprinter or didn't have any guys left, I gave it a go. It was an aggressive final which I didn't really expect. I think our guys were good. Stefan took a time bonus as well so I think everything today was good. It was quite hard but the guys put me in a pretty good position with Simon especially looking after me all day. I think the signs are good." "I felt a little bit blocked today but I think that's the same for most of the bunch especially as we came in a bit early and have done a lot of sitting around in hotels as well. It's not ideal but it's to be expected. I think today was not super hard but not so easy. I think the crucial stages are later on in the week so hopefully I could get the bad feelings out of the legs today."